Aquariums come in various shapes and sizes so that they can fit into the interior design of any home. 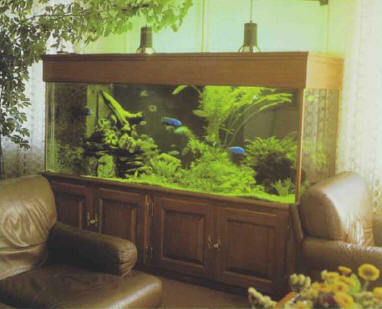 An aquarium can only be fully appreciated when it is integrated into its environment. Traditionally, most tanks take the form of a horizontal rectangle, but these days it is also possible to find cubes, vertical rectangles, or panoramic aquariums, all specially adapted to a specific setting. The basic model - and the cheapest - consists of a tank with a lid. It is also possible to equip it with a lighting hood. There are other models with an integral hood and minimal external decoration, i.e. a strip, of varying widths, that goes round both the base and the top, hiding the surface of the water. This type of aquarium can be sold on its own or with a support. It can sometimes be fitted with a filtration unit. Finally, in the top range, there are aquariums built into a piece of furniture, normally containing a filtration unit and lighting hood. The supporting furniture often has shelves or closets that serve to hide the pumps and other equipment, and the aquarium is framed by decorative elements that leave it visible from three sides. 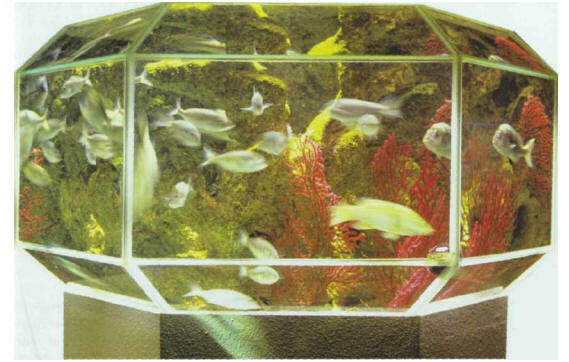 Commercial aquariums are almost always made of glued glass, with silicone joints. These materials are suitable for water volumes of around 500 liters - volumes rarely exceeded in the aquarium trade. The generalized nature of the materials and the relative simplicity of the gluing mean that any careful hobbyist can build a glued glass aquarium him or herself. For bigger volumes, polyester resin or cement are used, with only the front part of the tank made of glass. These are the materials found in public aquariums. Plexiglas, which is light but also scratches easily, is used for the rarer round forms. Small plastic tanks are also available for use as rearing or quarantine tanks. The most harmonious form is obtained when the length is equal to the height multiplied by 1.5-2.5. The height will be slightly greater than the width, except in built-in tanks, where the contrary is the case. These proportions can be adhered to up to a length of 1.5 m, but they are impossible after that, as the height must never exceed 0.5 m (see table). It is not advisable to use very narrow aquariums, as a trick of the eye means that a tank seems one-third narrower when it is filled with water, producing an unfortunate visual effect. Narrow tanks can be attractive, however, if they are put on narrow pieces of furniture, such as a mantelpiece or a dividing wall between two rooms. It is also important to take into account the weight of the tank. 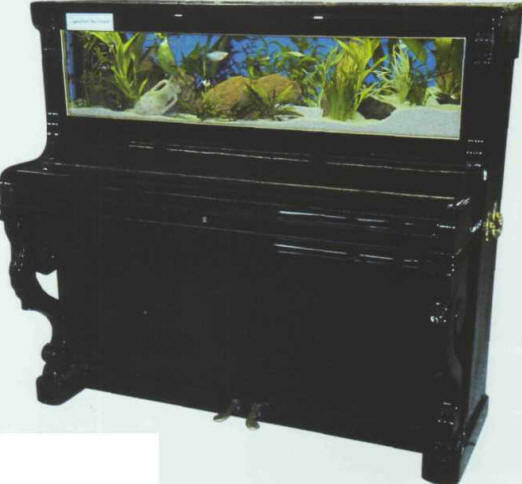 A solid support is required, because an aquarium is heavy when it is put into operation: the weight of the water and decor must be added to that of the tank itself. An aquarium must be positioned with care, as once it is filled it will be impossible to move it anywhere else. It is a complicated decision, involving the visual impact on the room, practical considerations, and ecological criteria. Obviously, a big tank fits better into a large room, and a narrow tank into a small room. Choose a fairly dark spot to highlight it, well away from the television, to avoid any competition between these two centers of attention. An aquarium traditionally has its longest dimension set against a wall, but there are other ways of setting it off. It can occupy a corner, be placed on a partition between two rooms, or be built into a wall. You must plan on having an electrical socket at an easy distance. A nearby tap would also be an asset, but if this is not possible make sure you have a hose for filling and draining the tank. When the aquarium is set against a wall, it is advisable to leave a space of a few centimeters at the back to make room for cables and pipes. The height of the aquarium also has to be planned with care, as it should be at eye level to be seen to advantage. Therefore, when it is placed in a main room, its base must be around 1 m from the floor, to see it without any problem. There are a huge number of original ways of setting off an aquarium. It is essential that sunlight, especially that coming from the south, does not strike the aquarium directly, as there is a danger that green algae will grow, not to mention an excessive increase in temperature in summer. It is therefore best to face the tank towards the north or east. Do not hesitate to try out different positions with an empty tank before taking a decision with lasting consequences. You must consider the gross volume (that of an empty aquarium) the net volume (when the tank is full, the sand and decor take up a certain amount of space) and the final weight of the aquarium when in operation. This depends on the bed and the extent of the decor; as these vary from one tank to another, the weight is therefore only indicated as a rough guide. The lid must be made of glass to allow light to enter the tank, and so it must be cleaned regularly. On a practical level, small pegs stuck to the top make it easier to handle, and some corners can be cut away to make room for pipes and electrical cables. Also for practical reasons, it is advisable to have several small lids which fit together, especially in big tanks. As we have already seen, the weight of an aquarium is quite considerable. It is therefore vital to set up a sturdy and perfectly horizontal support (check the latter with a spirit level). Special furniture is available in the aquarium trade, but you can just as well build one yourself, the essential point being that the weight is distributed on intermediary beams. The support can be the same size as the tank or bigger, but it should never be smaller, either in length or width. Put a sheet of water-resistant marine plywood - 10-15 mm thick, according to the dimensions and weight of the aquarium - on the support, and then cover this with a 15 mm thick polystyrene sheet, which will compensate for any irregularities in the support. If you are a do-it-yourself enthusiast and have patience, you can set the aquarium, together with its support, into a piece of wooden furniture, so that it can only be seen through its front pane. installing the aquarium near a radiator. УИЛКИНС (Wilkins) Губерт (1888-1958) , американский полярный исследователь, летчик. В 1913-39 участник ряда арктических и антарктических экспедиций, в т. ч. экспедиции Х. Свердрупа на подводной лодке "Наутилус" (1931). Совершил ряд полетов над Центр. Арктикой и Зап. Антарктидой (1927-30), участник поисков в Центр. Арктике С. А. Леваневского (1937-1938).